From promoting the cultural development of the city by providing educational school visits to the J. A. Vachon House, to assisting a youth centre improve adolescents’’ quality of life, to partnering with community centres to promote health, wellness and culture, the Vachon team has a passion for making an impact in their local community. J. A. Vachon House – ancestral home of Vachon snack cakes. Maison des Jeunes l'Utopie – Youth Centre dedicated to helping teens become active and responsible adult citizens in the community. Centre Caztel – Multi-functional community centre that offers a number of sports and cultural activities. Centre medical de la Nouvelle-Beauce – a local medical centre focused on promoting the health and wellness of community members. Our associates from our Winnipeg bakery supported the Winnipeg Aboriginal Sports Achievement Centre (WASAC) by purchasing much-needed sporting equipment for children at its summer camp and volunteering at the camp’s carnival day to provide and serve lunch to 250 children. WASAC opened its doors as a small non-profit organization in 1999 with two coaches, four leaders and 40 children. Since its launch, WASAC has grown significantly, offering development opportunities for children within the community. Annually, the WASAC hosts a summer camp for children in grades four to six from more than 100 schools across Manitoba. Schools are an integral part of the community and often require additional resources to enhance the learning and physical development of its students. Our associates in Edmonton provided the school with library materials and activity equipment to benefit the more than 500 students in the school, as well as the installation of basketball nets that can benefit the whole neighbourhood. On September 21, associates from our Edmonton sales centre and Edmonton contributed to the Root for Trees initiative, an enhanced tree planting program that aims to increase the number of trees planted in Edmonton. Thanks to the Edmonton Good Neighbour team, 150 trees, 50 of which were donated by Canada Bread, were planted at Earth Canada’s annual Earth Day event. ​On September 20, associates from our Edmonton facilities attended one Habitat for Humanity’s Adopt-a-Day events, where our associates volunteered their time at a Pre-Fab Shop constructing exterior walls for duplex homes that will be built for low-income families in need. Following the construction event, the team hosted a commemorative lunch to celebrate the partnership. On September 26, associates from our bakery and sales centre in Calgary, Alberta celebrated their partnership with the Calgary Food Bank's Weekends and More (WAM) Program. WAM operates in six elementary schools and is a collaborative hunger-prevention program aimed to provide children with access to the nutritious food they need to stay healthy and excel in school. After donating funds to the WAM program, our team volunteered their time to assemble over 360 hampers for the program. Thanks to the Good Neighbour Program, the Calgary team's project will help the WAM program keep children healthy and focused on learning. On June 16, associates from our bakery and sales centre in Calgary, Alberta, volunteered their time at the Calgary Dream Centre, a facility that guides men and women caught in cycles of poverty and addiction into lives of purpose. After donating funds to the centre to purchase food, our team prepared and served over 100 steak sandwich meals. Our associates in our Langley bakery and Langley sales centre supported the Township of Langley – Youth Services by creating the opportunity to provide free summer camp placements to local youth in the community. Approximately 45 weeks of summer camp was awarded during a Canada Bread-hosted community party held at Jackman Park Outdoor Pool which featured games, a barbecue lunch and Canada Bread baked snacks. The Township of Langley supports and facilitates the active, healthy lifestyles of its residents and guests by offering a wide variety of fitness, recreation, and leisure programs and facilities. Its Youth Services division offers local youth programs that support the growth and development of happy and healthy community members, including summer camp programs for school-age children. The camps focus on providing a safe, yet active, creative and fun environment for children whose parents are at work during the day. Our team also provided funds to a new initiative called the Pop-Up Youth Centre, a travelling youth centre supporting multiple community complexes in the Township of Langley. The funds purchased equipment and electronics to support the Pop-Up Youth Centre and are expected to be unveiled in early 2017. From July to October, associates from our Viau and Dandurand bakeries volunteered their time at the Vimont Green Alley and transformed it into a green space for kids to play and residents to enjoy. The goal of the Green Alley Initiative is to encourage residents to improve their environment in an urban setting, with improved air quality, a reduction of noise and the prevention of excessive heat in the summer. Our team did just that by donating materials for flower boxes, paint and outdoor furniture in addition to a financial contribution. The team also took an active role in the development of the space by volunteering their time to clean the alley, repaint flower boxes, paint new play lines on the ground, repair damaged concrete, install an artificial grass area with toys and build new flower boxes. More than 50 children are using the space each day. Congratulations to our team from our Laval, QC bakery and sales centre for successfully completing their Good Neighbour initiative with Centre François-Michelle! The team’s partnership with Centre François-Michelle, a school offering services to children with mild intellectual disabilities between the ages of four and 21, will improve the school’s La Boite ‘Lunch’ program. The five-year program consists of internal training courses and gradually introduces the students into ‘real world’ working environments. Thanks to the Good Neighbour Program, the team was able to donate equipment and tools such as industrial grade toasters, pots, pans, dishes, work tables, stove tops, utensils and baking supplies, to enhance the program and provide students with the opportunity to develop skills that will empower and equip them to enter the workforce. On September 10, associates from the Beauport and Vincent-Massey bakeries volunteered their time to revitalize La Ritournelle Daycare Centre, which services over 90 children. The team donated storage bins to prevent toys from the wear-and-tear of weather conditions and fresh herb gardens for daily meals and the promotion of learning how food is grown. The team also volunteered their time to brighten up the daycare’s outdoor space by removing weeds and restoring outdoor furnishings to encourage the children and daycare workers to utilize the outdoor space. Maison Marie Rivier is a home for troubled youth 12 to 17 years of age. Its mission is to offer resources needed to help broaden the knowledge and skills of youth, encourage development and manage social issues such as substance abuse, delinquency, violence and suicidal thoughts. It also has the mandate to develop theatrical events that contribute to the creation of homegrown talent. Since its launch, Maison Marie Rivier has helped many youth manage issues and develop into contributing members of society. Unfortunately, a number of Maison Marie Rivier’s facilities had become outdated or unusable over its years in operation. This included two bathrooms within the youth home. As a result of the hard work from the team in Drummondville, along with the support of the Good Neighbour Program, significant improvements were made to the facility and the bathrooms were renovated to enable the organization to continue to support the community. The École Kennebec foundation offers financial assistance to young children whose parents struggle to provide for them. Thanks to the Good Neighbour Program, the partnership between Canada Bread and the foundation will help more children and their parents, access cartons of milk and school supplies and participate in end-of-school-year outings. Our Sales Centres in Lévis and Jean-Marchand, Quebec worked together to provide 20 young people the opportunity to play soccer with the Lévis-East Soccer Club for the 2016 season with a financial assistance program. This means more children in the area will be able to be physically active and participate in a team sport. The team from the Ottawa, ON Sales Centre partnered with St. Gabriel’s School, an institute recognized as best-in-class, environmentally friendly and technologically-advanced. The sustainability-focused project involved working with 80 students across two grade five classes to construct two garden towers designed for growing fruits and vegetables. In addition to playing an active role in the cultivation of the gardens, the systems help with classroom studies. The students were assigned to investigate and write essays describing the units and explaining the value of growing nutritious food. Through our Good Neighbour Program, our associates helped create a 'third space', an interactive, engaging activity area in the community centre where youths from Kindergarten to Grade 6 gather. Supplies and AV equipment including a projector, gaming systems, an Android box, Apple TV, speakers and furniture were donated and can be used both indoors and outdoors, making it a functional year round space for almost 400 children. ​On July 16, our associates from the Cambridge sales centre joined the Paulander neighbourhood and more than 200 other guests from the community centre at their annual barbecue. The team helped with the meal preparation, set up and tear down of the event. In July, associates at our Brampton, ON Distribution Centre kicked-off their Good Neighbour partnership with The Shining Through Centre for Children with Autism, a not-for-profit charitable organization. The centre is a recognized leader in Autism research, providing service excellence in therapy, education, research and awareness to affected children and their families. On July 24, our associates and their families, our company mascot, Osito Bimbo and Board Members of the organization hosted a barbeque and participated in the organization’s bi-weekly baseball game, with more than 50 people! The centre was also in need of kitchen equipment to teach food preparation skills as an important, empowering tool towards achieving independence and the Brampton team donated many household kitchen items including a refrigerator, stove and dishwasher. Since 2008, Family Respite Services and the Town of LaSalle Vollmer Complex have offered inclusive programs to everyone in the community, including those with disabilities. Our Windsor associates sponsored 50 Windsor-area youth, enabling them to participate in programs with peers, designed just for teens with disabilities and also volunteered to help with the program for one of their Friday Fun nights. The team’s partnership with the St. Catharines Horticultural Society – a local group of community members who share a love and passion for gardening – helped support the redevelopment of an old, unused industrial lot to a new green space for local residents. Our St. Catharines’ associates participated in landscaping, litter pick-up, installation of city-certified waste receptacles and other enhancements of the park. On October 19, our Pickering associates teamed up with the City of Pickering and the Toronto and Region Conservation Authority to help refresh and restore the facility’s neighbourhood. Over time, members of the community had illegally disposed of construction and home renovation waste on the street near our local sales centre, polluting the neighbourhood and potentially making it unsafe for those who live and work in the area. The team assisted in the litter collection, organizing a garbage pick-up and beautifying land along the waterfront trail and Lake Ontario, which included the addition of 20 newly planted trees. Our Markham, ON team partnered with Ashton Meadows Public School to contribute to its breakfast program and make a difference in the nutritional needs of its students. Thanks to the Good Neighbour Program, the team supported the school in a number of ways including the preparation of a morning snack for 300 students, the donation of a new refrigerator for the school and a $250 grocery store gift certificate to assist with future program purchases. Since 1912, the Glanworth Branch of the London Public Library has served the needs of the community. To continue servicing the community, help was needed to finish its restoration of the exterior of the building. Our associates in London, ON assisted by enhancing the outdoor garden and resting areas to provide a new public space for visitors. Product was donated throughout the year to support the St. Patrick's Parish outreach program, which supplies sandwiches to the community daily and holds a weekly barbecue for the homeless. As the weather changed, the Hamilton and Ancaster facilities’ Good Neighbour committee donated and delivered 148 new Canada Bread winter coats to the homeless people of Hamilton. In the spirit of nourishing Canadians, the Hamilton and Ancaster teams provided supplies for Thanksgiving dinner and groceries for the food bank to assist them in providing a sit-down Thanksgiving meal for the homeless and for the distribution of meal supplies to local families in need to prepare a wonderful Thanksgiving meal at home. The YWCA of Hamilton partnered with Canada Bread to provide a unique learning experience for children attending the subsidized YWCA summer day camp. We helped the YWCA camp take the children to a Hamilton museum to learn about historical aircraft and provided each child with some delicious Canada Bread products to take home to enjoy with their family. From May 10 to June 9, our three facilities in Hamilton and Ancaster, ON held a "Baby Drive" to gather baby-specific items for the Good Shepherd food bank which serves 1,000 community members a day. Items collected included clothes, toys, formula, food, diapers, and wipes. 17 of our associates also helped the food bank sort clothes, shoes and bedding and package food products for delivery. On April 22, in the spirit of Earth Day and in collaboration with the City of Hamilton, associates from our three Hamilton and Ancaster facilities joined together as one team to clean-up the Chippewa Trail in Hamilton. More than 30 volunteers came out. Thank you to City of Hamilton for donating gloves, garbage bags and recycling bags to support our initiative. On June 23, associates from the Barrie, ON Sales Centre volunteered their time with Simcoe County's Andrew Hunter Elementary School Breakfast Club program. The team prepared grilled cheese sandwiches and fresh fruit and delivered the breakfasts to each classroom. New kitchen equipment including an industrial toaster, cheese slicer, new carts for easy deliveries to classrooms and other items such as gift cards to purchase food and gym equipment to encourage physical activity were donated to help the program on an ongoing basis. On July 7, associates at our Woodstock, NB bakery celebrated their Good Neighbour partnership of financial and volunteer support, with The Woodstock Golf and Curling Club (WGCC), an organization committed to the physical activation of youth through golf and curling. Our donation to the WGCC provided 40 youths the opportunity to participate in the club and covered all of their equipment costs associated with both golf and curling. Associates from our St. John’s, Newfoundland bakery supported The Gathering Place’s adult literacy program as part of the Good Neighbour Program through the donation of a new computer library with desktop computers, work stations and general office supplies to enhance their existing literacy program offerings of basic reading and math support. The Gathering Place is a service centre committed to building community, promoting equality and providing the necessities of daily life for those seeking respite from loneliness and isolation. Since it opened its doors in 1993, the Gathering Place has strived to meet the fundamental needs of marginalized individuals (aged 25 years and older) in the community and to provide necessary support and skills to ensure a smooth transition into work and training programs. On August 22, associates from our Moncton Bakery celebrated with The Moncton East Youth Centre, a non-profit centre offering after school day care and summer camps to all children including recreational activities for children with physical, mental and emotional disabilities and children with speech or learning disabilities. Our team donated their time by painting the youth activity room, designing artwork, installing and assembling donated electronics and furniture such as TVs, shelving, gaming systems, computers and chairs, as well as creating handmade window, TV and Bingo board coverings. They also supported the Youth Centre’s annual summer block party by donating cakes, hotdog and hamburger buns. This initiative helped create a safe place for the children of the local community and enabled the donation of their four older televisions to the Residence Aventure – Elmwood Seniors Residence for new residents who do not have access to a TV. On June 1​7, associates from the Bedford Sales Centre volunteered their time building 46 planter boxes, six of which are wheelchair accessible, at the Northwood – West Bedford Community Garden. The Bedford team donated the planter box materials, built, assembled the boxes and prepared them for harvest to promote sustainability and cost-effective food sources. The garden boxes grow fresh fruit and vegetables for underprivileged community members, either directly or through the sale of the produce to help maintain the boxes in the community. The one-acre garden park is now open to the public for social gatherings, community events and relaxation. On September 24, our teams from both our Hamilton bakeries joined forces to pull a 200,000 pound airbus jet to raise money for United Way. 18 teams competed at the Hamilton Airport UPS terminal to be the strongest and fastest to pull a jet. Dressed for success in Canada Bread ‘Top Buns’ t-shirts, our “Canada Bread Team on the Tarmac” came in fourth place (very impressive!) and raised $2,170.00 (including a $1,000 Canada Bread associate participation grant) for the United Way of Burlington and Greater Hamilton. In 2016, we collaborated with Walmart Canada to help them with their campaign to raise money and awareness for the Children’s Miracle Network. For every sale of Villaggio sliced bread sold, $0.25 was donated to Children’s Miracle Network. We also participated in another Customer partnership program to support Breakfast Clubs of Canada through the provision of product to Sobey’s and Metro to donate to the program throughout the year. We believe in limiting our carbon footprint through the reduction of waste and support this belief through the donation of surplus product to local organizations and food banks. To deepen this commitment, in 2017, we are building ongoing partnerships with food banks across the country. The promotion of Wellbeing is a key pillar in our Sustainability platform. This is why in 2016, we focused financial donations and donations of fresh product to support multiple community organizations that were food-based organizations with a focus on physical activation and/or health and wellness. Our team in Woodstock, NB, proudly completed four Good Neighbour projects in their community in 2017. On July 23, associates helped out at the WAFFA’s softball tournament to help fundraise for 15 foster homes and 30 foster children in the area. The team donated food for the event and volunteered during the tournament. On July 25, 2017, associates partnered with The Hospital Activity Book for Children, an organization that designs activity books for children aged four to 12 years that spend extended periods of time in the hospital. Associates sponsored the publication of the activity book and delivered copies to patients at the Upper River Valley Hospital. Many children now have access to fun activities that create interactive opportunities to help them express their thoughts, fears and feelings while they are sick. On September 8, 2017, associates from partnered with Community Safety Net, an award-winning provider of educational safety materials for children and families. Working hand-in-hand with like-minded partners in communities across the United States and Canada since 1989, Community Safety Net ensures young people have access to information on topics such as fire prevention, drugs, personal safety and health. Providing kids with facts empowers them to make smart decisions that will keep them safe from harm. 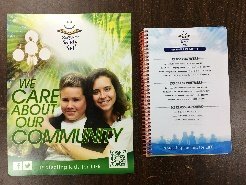 The safety publications were delivered to children from Kindergarten to Grade 8 in two local Woodstock, NB schools by the Town of Woodstock Police Department and Canada Bread associates. On October 26, 2017, the team partnered with Valley Food Bank to provide fresh product donations on a weekly basis. In addition, our associates volunteered one hour each week at the food bank, completing general housekeeping, stocking shelves and delivering food. On November 2, 2017, the teams at our bakeries in Viau and Dandurand, QC, partnered with the L’Oeuvre des Samaritains, a local food bank that services families and is managed by volunteers. Our associates purchased a large freezer to replace one that broke along with a commercial coffee maker. Providing 200 copies of a food conservation guide. Hamilton and Ancaster Facilities give back with two Good Neighbour Projects! The teams sponsored a day trip to the African Lion Safari as part of the YMCA of Hamilton’s summer camp program, with 95% of participant costs subsidized for local children. At the end of the day, a group of associates met the children at four locations to provide them with fresh product, a reusable bag and Canada Bread Frisbee. The teams came together to provide a Thanksgiving meal for the homeless through St. Patrick’s Parish and the Good Shepherd Food Bank. Our associates donated turkeys and hams along with rolls and snack cakes. The teams also donated bread, hot dog buns and hamburger buns on a weekly basis, to support a weekly barbecue for the homeless. The donations ensured that locals in the community had access to a hot meal on a regular basis. On October 31, 2017, associates from our bakery in St. John’s, NL partnered with the Senior’s Resource Centre, an organization that supports the wellbeing and independence of older persons living in Newfoundland, to help facilitate the development and implementation of new programs. The team contributed an adjustable desk, a computer, two display stations and participated in an educational “Lunch and Learn”. Local seniors now have access to resources to help them make informed decisions about their health and independence. On October 27, 2017, associates from Canada Bread’s Distribution Centre in Ottawa, ON completed their Good Neighbour project with the Stittsville Community Garden, a local garden that grows a blend of organic vegetables, fruits, herbs and flowers. Through the team’s donation of top soil and volunteer efforts, which included planting bushes and spreading manure, local residents now have access to a healthier garden to grow organic food. Our Vachon Bakery team in Ste-Marie de Beauce, QC, has a passion for making an impact in their local community. The team is proud to promote the cultural development of their community through educational school visits to the J.A. Vachon House and partnering with community centres to support health and wellness. Langley Team Assembles Care Kits for Local Resource Centres! On October 31, 2017, associates from Canada Bread’s Bakery and Distribution Centre in Langley, BC partnered with both Gateway of Hope Resource Centre and HUB - Youth Resource Centre. To support the centres, the team purchased materials and personal items to assemble individual care packages to be donated and distributed by the organizations to the community. The 200 care packages were divided between the two centres and contained personal hygiene kits, gloves, toques and socks. In addition to the care packages, the team ran a clothing drive to supplement the care kit donation with warm garments and other clothing. On August 21, 2017, associates from Canada Bread’s Distribution Centre and Bakery in Winnipeg, MB partnered for the second year with the Winnipeg Aboriginal Sport Achievement Centre (WASAC)’s 2017 WASAC Kids' Summer Camp. WASAC is a non-profit organization that offers development opportunities for thousands of children in Winnipeg. It is also Canada’s largest employer of Aboriginal youth. This year, the team helped coordinate the WASAC’s Kid’s Summer Camp carnival by preparing food, coordinating sports, painting faces and helping with the games. Through this initiative, WASAC was able to manage transportation costs to and from camp and provide nutritious lunches and snacks to all 250 children in Grades 4-6 attended the carnival. Calgary Distribution Centre Puts Good Neighbour Into Action! On October 17, 2017, associates from Canada Bread’s Distribution Centre in Calgary, AB partnered with the Calgary Food Bank, an organization that services thousands of local community organizations, shelters and soup kitchens. This year, the food bank hosted OctoberFeast, an event that partnered with 20 local restaurants and Chefs to create a signature dish using at least two of the food bank’s most-needed items. The proceeds from the meal sales were donated to the Calgary Food Bank to help purchase fresh food for Emergency Food Hampers. Our associates supported OctoberFeast by donating funds and volunteering their time to sort food donations and assemble food hampers. Ancaster Good Neighbour Teams SHOOTS and SCORES! In 2017, associates from Canada Bread’s Distribution Centre in Ancaster, ON, partnered with the Lawfield Minor Hockey Association to encourage healthy active lifestyles. The team’s volunteer efforts and sponsorship of the Lawfield Minor Hockey Association helped to offset the costs associated with registration, ice-time and jerseys for players who would otherwise not be able to play. Good Neighbour Pedals On in Edmonton! On August 19, 2017, associates from our Edmonton, AB bakery and Distribution Centre partnered with Sustainable Food Edmonton’s (SFE) Community Garden Bike Tour and Barbecue. SFE supports projects and programs to encourage the building of community through urban agriculture. The Community Garden Program, helps communities start gardens and keep them thriving with funding, resources and support. The Annual Bike Tour showcases the urban agriculture in Edmonton and encourages networking and community building opportunities. The donated funds from the Good Neighbour program will be used to start new community gardens and assist with the purchase of garden sheds, tools, benches and other needs. Our associate’s volunteer efforts included purchasing food and promotional giveaway items, organizing permits and rental items for the barbecue, handing out swag, registering bike tour participants, giving away snacks, cooking and event clean-up. In July 2017, our bakery and Distribute Centre associates in Laval, Quebec, executed their Good Neighbour project with Dolphin Children’s House’s Confide in Dolphin program. Confide in Dolphin is a confidential communication program that offers children the opportunity to express their feelings through letters or drawings and to feel they’ve been heard with a personalized response back. This year, our associates ensured that 88 new primary schools will be added to the list of 28 schools already benefitting from this communication program. Volunteers will also be provided with training and promotional tools for parents and teachers, new furniture, letter binders and window blinds to help assist them in responding to the 12,000 children that use the program annually. On September 16, 2017, associates from Canada Bread’s bakery in Levis, QC and Distribution Centre in Jean-Marchand, QC, partnered with Maison de la Famille Rive-Sud, an organization that offers a variety of services for families in the Lévis region, including educational seminars, meditation and other services. To support the organization, our associates donated funds and volunteered by setting-up and supervising activities at one of the organization’s fundraising events. Pickering Distribution Centre Cleans Up the Waterfront! On September 13, 2017, the team at the Pickering, ON Distribution Centre partnered with the City of Pickering to clean up garbage along the Waterfront Trail and Beach. They also planted a commemorative tree and installed a bench along the trail. Local residents now have a place to sit and relax while on strolls through the well-maintained trail. 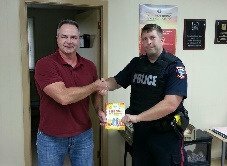 Markham Distribution Centre puts Good Neighbour into Action! On September 12, 2017, our associates from the Distribution Centre in Markham, ON, supported the Yellow Brick House, an organization that provides support for women and children fleeing abusive situations. Through volunteer and donation efforts, our associates made 200 lunches for children to bring to school, cleaned the warehouse and donated and installed a new refrigerator. On September 30, 2017, associates from Canada Bread’s facilities in Vincent-Massey, QC, executed their Good Neighbour project with La Ritournelle, a local daycare centre. Associates volunteered to renovate the daycare’s outdoor play space by installing new tables and benches and painting existing areas. The revitalized space provides 100 children between the ages of six-months to five with a safe space to play outside and engage in physical activity. Good Neighbour is Rooted in London, ON! On October 15, 2017, associates from Canada Bread’s Distribution Centre in London, Ontario, partnered with Reforest London, a charitable non-profit organization dedicated to enhancing environmental and human health through the benefit of trees. To support Reforest London’s Million Dollar Tree Challenge, our team sponsored a tree planting event at a local park. 150 trees were donated and associates took part in organizing the event with a snack station and swag. Working together with local volunteers, 120 of those trees were planted in a special environmentally significant area. Reforest London is half-way to their goal of planting one million trees. Associates from our Bedford Sales Centre volunteered their time to the Northwood – West Bedford Community Garden after donating materials to build 46 planter boxes, six of which are wheelchair accessible. The Bedford team helped build and assemble the planter boxes and shoveled 10 wheel barrel loads of soil into them in preparation for harvest. The one-acre Garden Park will be open to the public for social gatherings, community events and just to relax. The park will be a place where individuals of all abilities and ages can enjoy a welcoming outdoor space where they are free to take part in recreation. The garden boxes donated by our Sales Centre will provide fresh fruit and veggies to underprivileged community members and sold to help maintain the boxes in the community. Other benefits include the promotion of a sustainable community by enabling people to grow food locally while demonstrating the impact of rain water harvesting, solar technology and composting, provide a cost-effective source of food for families, preserve cultural heritage through food, connect to the increasingly diverse society and demonstrate in a real way that farming can be fun, family activity. Our bakery in Calgary, AB donated 350 cases of bread to local food banks in response to the May, 2016 wildfires that forced more than 80,000 people from their homes and caused an estimated $4.5 billion in damage in Fort McMurray, AB. To support United Way’s We are Possibility campaign nationally, we run an associate payroll deduction program annually and in 2016, we also offered a Corporate Matching program. We believe in limiting our carbon footprint through the reduction of waste and support this through the donation of surplus products to local organizations and food banks. To deepen this commitment, in 2017, we are building ongoing partnerships with food banks across the country. We also contributed through financial donations and by contributing fresh bread to support multiple community organizations that are food-based with a focus on physical activation and/or health and wellness. In 2016, we collaborated with Walmart Canada in their campaign to raise money and awareness for the Children’s Miracle Network. For every sale of Villaggio sliced bread sold, $0.25 was donated to Children’s Miracle Network. We also supported Breakfast Clubs of Canada by donating products through Sobey’s and Metro during the year. In 2016, Canada Bread launched the Good Neighbour program in every bakery and distribution centre across the Canada. With an assigned budget, each facility worked on project in their local community to the benefit of residents by supporting local causes that they were passionate about. In its first year, Canada Bread achieved 100 per cent participation from all 25 locations and more than 30 different projects were completed nationwide. In 2017, we expect even more associate driven projects and initiatives that will positively impact local communities. On June 17, associates from the Bedford Distribution Centre volunteered their time building 46 planter boxes, six of which are wheelchair accessible, at the Northwood – West Bedford Community Garden. On August 22, associates from our Moncton Bakery donated their time by painting the youth activity room, designing artwork, installing and assembling donated electronics and furniture such as TVs, shelving, gaming systems, computers and chairs, as well as creating handmade window, TV and Bingo board coverings. They also supported the Youth Centre’s annual summer block party by donating cakes and hotdog and hamburger buns. The Moncton East Youth Centre, a non-profit centre offering after school day care and summer camps to children including recreational activities for children with physical, mental and emotional disabilities and children with speech or learning disabilities. This initiative helped create a safe place for the children in the local community and enabled the Centre to donate their four older televisions to the Residence Aventure – Elmwood Seniors Residence for new residents who do not have access to a TV. Associates from our St. John’s, Newfoundland Bakery supported The Gathering Place’s adult literacy program through the donation of a new computer library with desktop computers, work stations and general office supplies to enhance their existing literacy program offerings of basic reading and math support. On July 7, associates at our Woodstock Bakery supported the Woodstock Golf and Curling Club (WGCC) by providing 40 youths the opportunity to participate in the club and covered all of their equipment costs associated with both golf and curling. The WGCC is an organization committed to the physical activation of youth through golf and curling. On June 23, associates from the Barrie Distribution Centre volunteered their time with Simcoe County's Andrew Hunter Elementary School Breakfast Club program. The team donated new kitchen equipment including an industrial toaster, cheese slicer, new carts for easy deliveries to classrooms and other items such as gift cards to purchase food and gym equipment to encourage physical activity were donated to help the program on an ongoing basis. The also celebrated the partnership by preparing breakfast for the kids of grilled cheese sandwiches and fresh fruit that were delivered to each classroom. On April 22, in the spirit of Earth Day, and in collaboration with the City of Hamilton, associates from our three Hamilton and Ancaster facilities joined together as one team to clean-up the Chippewa Trail in Hamilton. More than 30 volunteers came out. Thank you to City of Hamilton for donating gloves, garbage bags and recycling bags to support our initiative. From May 10 to June 9, our three facilities in Hamilton and Ancaster held a "Baby Drive" to gather baby-specific items for the Good Shepherd food bank which serves 1,000 community members a day. Items collected included clothes, toys, formula, food, diapers, and wipes. Seventeen of our associates also helped the food bank sort clothes, shoes and bedding and packaged food products for delivery. The YWCA of Hamilton partnered with our three facilities in Hamilton and Ancaster to provide a unique learning experience for children attending the subsidized YWCA summer day camp. We helped the YWCA camp take the children to a Hamilton museum to learn about historical aircrafts and provided each child with some delicious Canada Bread products to take home to enjoy with their family. In the spirit of nourishing Canadians, the Hamilton and Ancaster teams provided the St. Patrick’s Parish with food for their annual Thanksgiving dinner for the homeless. They also provided groceries so the food bank could distribute meal supplies to local families in need to prepare a wonderful Thanksgiving meal at home. With the onset of winter, the Hamilton and Ancaster Good Neighbour committee donated and delivered 148 new Canada Bread winter coats to homeless people in Hamilton. Bread was donated during the year to support St. Patrick's Parish outreach program. The Parish makes sandwiches for community members daily and has a weekly barbecue to help feed the homeless. Since 1912, the Glenworth Branch of the London Public Library has served the needs of the community. To continue its service, help was needed to finish the restoration of the exterior of the building. Our associates in London assisted by enhancing the outdoor garden and resting areas to provide a new public space for visitors. Our Markham team partnered with Ashton Meadows Public School to support its breakfast program to make a positive impact in the nutritional needs of its students. The team supported the school in a number of ways including preparing the morning snack for 300 students, donating new refrigerator for the school and a $250 grocery store gift certificate to assist with future program purchases. On October 19, our Pickering associates teamed up with the City of Pickering and the Toronto and Region Conservation Authority to help refresh and restore the facility’s neighbourhood. Over time, members of the community had illegally disposed of construction and home renovation waste on the street near our local Distribution Centre and potentially making it unsafe for those who live and work in the area. The team picked up litter, organized a garbage pick-up and beautified the land along the waterfront trail and Lake Ontario, which included the addition of 20 new trees. The team’s partnership with the St. Catharines Horticultural Society, a local group of community members who share a love and passion for gardening, helped support the redevelopment of an old, unused industrial lot into a new green space for local residents. Our St. Catharines associates participated in landscaping, litter pick-up, installation of city-certified waste receptacles and other enhancements of the park. In July, associates at our Brampton Distribution Centre partnered with The Shining Through Centre for Children with Autism, a not-for-profit charitable organization. The centre is a recognized leader in Autism research, providing service excellence in therapy, education, research and awareness to affected children and their families. Through the program, associates donated much needed kitchen equipment refrigerator, stove and dishwasher to teach food preparation skills as an important, empowering tool towards achieving independence. Associates celebrated this partnership on July 24 with their families, our company mascot, Osito Bimbo, and Board Members of the organization with a barbeque and participated in the organization’s bi-weekly baseball game, with more than 50 people! Associates from our Cambridge Distribution Centre helped create a third space, an interactive, engaging activity area, in Paulander Community Centre where youths from Kindergarten to Grade 6 can gather. Supplies and AV equipment including a projector, gaming systems, an Android box, Apple TV, speakers and furniture were donated and can be used both indoors and outdoors, making it a functional year round space for almost 400 children. On July 16, our associates joined more than 200 other guests from the Paulander Community Centre for their annual barbecue. The team helped with the meal preparation, set up and tear down of the event. Associates from the Ottawa Distribution Centre partnered with St. Gabriel’s School, an institute recognized as best-in-class, environmentally friendly and technologically-advanced. The sustainability-focused project involved working with 80 students across two grade five classes to construct two garden towers designed for growing fruits and vegetables. In addition to playing an active role in the cultivation of the gardens, the tower systems will also help with classroom studies. The students were assigned to investigate and write essays describing the units and explaining the value of growing nutritious food. Our Distribution Centres in Lévis and Jean-Marchand worked together to provide 20 young people the opportunity to play soccer with the Lévis-East Soccer Club during the 2016 season with a financial assistance program. This meant more children in the local area were able to be physically active and participate in a team sport. Associates from our St. Come Bakery directly support the École Kennebec by donating school supplies and their daily milk program as well as participate in end-of-school-year outings. The École Kennebec foundation offers financial assistance to young children whose parents struggle to provide for them. Associates from our Distribution Centre in Drummondville partnered with the Maison Marie Rivier to make significant improvements to the facility and renovated two bathrooms. These enhancements to the facility ensured that the Maison they could continue to do the valuable work that they do to make a difference in the community. Since its launch, Maison Marie Rivier has helped many youth manage issues and develop into contributing members of society. Unfortunately, a number of Maison Marie Rivier’s facilities had become outdated or unusable over its years in operation. On September 10, associates from our Beauport and Vincent-Massey Bakeries volunteered their time to revitalize La Ritournelle Daycare Centre, which services more than 90 children. The team donated storage bins to prevent toys from damage from weather conditions and fresh herb gardens for daily meals as well as to teach kids how food is grown. The team volunteered their time to brighten up the daycare’s outdoor space by removing weeds and restoring furnishings to encourage the children and daycare workers to utilize the outdoor space. Our associates from our Laval, Bakery and Distribution Centre partnered with the Centre François-Michelle. Associates donated equipment and tools such as industrial grade toasters, pots, pans, dishes, work tables, stove tops, utensils and baking supplies, to enhance the program and provide students with the opportunity to develop skills that will empower and equip them to enter the workforce. The Centre François-Michelle is a school that offers services to children with mild intellectual disabilities between the ages of four and 21, will improve the school’s La Boite ‘Lunch’ program. The five-year program consists of internal training courses and gradually introduces the students into ‘real world’ working environments. From July to October, associates from our Viau and Dandurand Bakeries supported the Vimont Green Alley and transformed it into a green space for kids to play and residents to enjoy. The goal of the Green Alley Initiative is to encourage residents to improve their environment in an urban setting, with improved air quality, a reduction of noise and the prevention of excessive heat in the summer. Our team did just that by donating materials for flower boxes, paint and outdoor furniture in addition to a financial contribution as well as their time. The team also took an active role in the development of the space by volunteering their time to clean the alley, repaint flower boxes, paint new play lines on the ground, repair damaged concrete, install an artificial grass area with toys and build new flower boxes. More than 50 children use the space each day. From promoting the cultural development of the city by providing educational school visits to the J. A. Vachon House, to assisting a youth centre improve adolescents quality of life, to partnering with community centres to promote health, wellness and culture, the Vachon team has a passion for making an impact in their local community. Throughout 2016, the team supported the following organizations through financial contributions: J. A. Vachon House – ancestral home of Vachon snack cakes, Maison des Jeunes l'Utopie – Youth Centre dedicated to helping teens become active and responsible adult citizens in the community, Centre Caztel – Multi-functional community centre that offers a number of sports and cultural activities and Centre medical de la Nouvelle-Beauce – a local medical centre focused on promoting the health and wellness of community members. Our associates in the Langley Bakery and Langley Distribution Centre supported the Township of Langley – Youth Services by creating the opportunity to provide free summer camp placements to local youth in the community. Approximately 45 weeks of summer camp was awarded during a Canada Bread-hosted community party held at Jackman Park Outdoor Pool which featured games, a barbecue lunch and Canada Bread baked snacks. Our team also provided funds to create a new Pop-Up Youth Centre, a travelling youth centre supporting multiple community complexes in the Township of Langley. The funds purchased equipment and electronics to support the Centre that is expected to be unveiled in early 2017. On June 16, associates from our Bakery and Distribution Centre in Calgary volunteered their time at the Calgary Dream Centre, a facility that guides men and women caught in cycles of poverty and addiction into lives of purpose. After donating funds to the Centre to purchase food, our team prepared and served more than 100 steak sandwich meals. On September 26, associates from our Bakery and Distribution Centre in Calgary celebrated their partnership with the Calgary Food Bank's Weekends and More (WAM) Program. WAM operates in six elementary schools and is a collaborative hunger-prevention program aimed to provide children with access to the nutritious food they need to stay healthy and excel in school. After donating funds to the WAM program, our team volunteered their time to assemble more than 360 hampers to the program. Our support helped the WAM program keep children healthy and focused on learning. On September 20, associates from our Edmonton facilities attended one Habitat for Humanity’s Adopt-a-Day events, where they volunteered their time at a Pre-Fab Shop constructing exterior walls for duplex homes that will be built for low-income families in need. Following the construction event, the team hosted a commemorative lunch to celebrate the partnership. On September 21, associates from our Edmonton Distribution Centre and Edmonton Distribution Centre contributed to the Root for Trees initiative, an enhanced tree planting program that aims to increase the number of trees planted in the city. More than 150 trees, 50 of which we donated, were planted at Earth Canada’s annual Earth Day event. Schools are an integral part of the community and often require additional resources to enhance the learning and physical development of its students. Our associates in Edmonton provided the Winterburn School with library materials and activity equipment, like basketball nets to benefit the more than 500 students in the school, as well the surrounding neighbourhood. Our associates from our Winnipeg Bakery supported the Winnipeg Aboriginal Sports Achievement Centre (WASAC) by purchasing much-needed sporting goods equipment for children at its summer camp and by volunteering at the camp’s carnival day to provide and serve lunch to 250 children.